When you reach for some food off the shelf, it’s hard to know what’s in it. With so many processed and packaged foods, keeping track of the calorie content, fat level and grams of sugar per serving in every item you eat is difficult. However, managing your calorie intake requires this sort of knowledge. 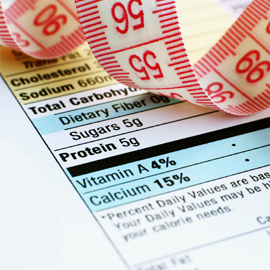 This is why food labels are helpful when it comes to managing a healthy diet and lifestyle. Also called nutrition labels, these black and white grids are printed on the back or side panel of absolutely every bag, box or bottle of pre-packaged food you will buy in the United States. All of this information is regulated for accuracy so you can be sure that you are making the most informed decision possible every time you go to the grocery store. All nutrition fact labels are set up the same way. Once you understand what you’re looking for and what all of the numbers, percentage points and abbreviations mean, you’ll be able to quickly glean all of the information you need with a mere glance at the packaging. Always start at the top and work your way down. The top of the nutrition label will tell you the calories in each serving, and the serving size. Pay close attention to the exact serving size. If you eat more than one serving, you’ll have to account for the added calories in your daily food log. Limit the amount of fat, cholesterol, sodium and sugar. When over-consumed, these nutrients can contribute to weight gain. Add up the positive nutrients. This includes the vitamins, the protein, the minerals and the fiber. Perhaps the most confusing aspect of the nutrition label is the percent daily value. This is the information you’ll find alongside the percentage marks on the right hand of the food label. Percent daily value tells you what percentage of your daily value you’ll consume of each nutrient per serving you eat. When you see a total number of grams of a certain nutrient, it may seem like a lot or a little, but out of context it is difficult to know—especially as you are just starting to read nutrition labels. The percent daily values determine how much one serving of the item in question provides to your nutrient quota for the day. Try finding foods with more than 20% daily value for nutrients like protein, minerals and vitamins, and with less than 5% for fats and sugars.